While this sweet-salty-sour salad combination has been around for years, smoking the watermelon prior to cubing it takes the dish to a whole new level of deliciousness. It’s a refreshing, light, flavourful treat that will add a wow factor to any summer menu. If you’re keen to explore the magical world of playing around with fresh produce and smoke, watermelon is a great place to start because it is porous and therefore easily infused with smoke in just a short time. Infusing watermelon with smoke gives this salad a huge flavour pop that will intrigue and impress your guests. While chips are soaking, cut watermelon lengthwise into two pieces and then cut these segments in half. You’ll now have four large pieces of melon. This gives more surface area to absorb the smoke. Drain wood chips and place on a sheet of heavy duty tin foil; fold up edges to make a packet. Pierce holes all over the top of the packet. Place directly on top of burner of gas barbeque and preheat barbeque to very hot. As soon as packet begins to smoke (depending upon your grill, this could take up to 30 minutes), reduce heat in barbeque to medium (or, if possible, leave burner under packet on high and turn off other burners). Place watermelon, rind side down, directly on grill, as far away from the packet of smoking wood chips as possible (over one of the burners that has been turned off). Smoke for 20 minutes (by this point the packet will stop emitting smoke). 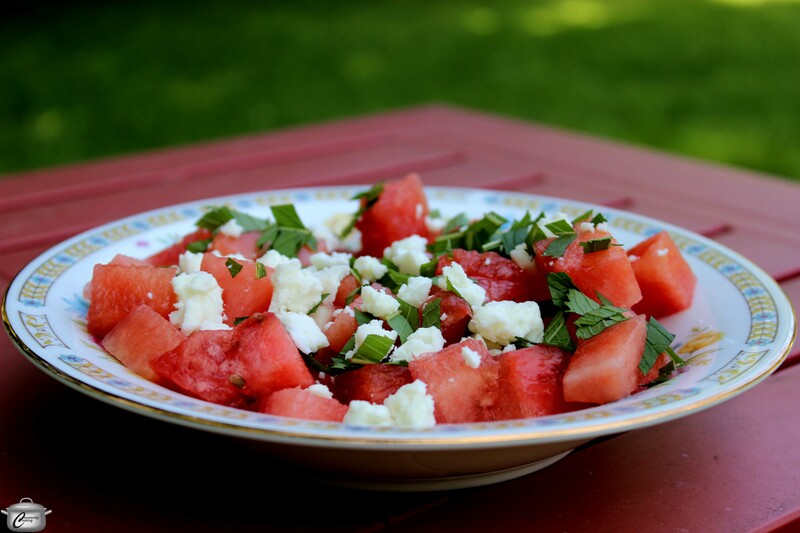 Remove smoked watermelon from barbeque and cut rind off; cut flesh into ¾ inch (2 cm) cubes. Gently place cubes in a colander and let drain for 10 minutes. Refrigerate until ready to assemble salad, no more than one hour before serving. Note that you can smoke the watermelon up to 24 hours prior to serving, as long as you have the means to refrigerate it afterwards. To assemble salad, place drained, chilled watermelon cubes in a serving bowl. Make vinaigrette by combining lime juice, olive oil, salt and pepper in a small jar with a tight lid and shake well until blended (this can be done ahead of time). Drizzle the watermelon with the vinaigrette and toss gently to combine. Sprinkle the chopped mint leaves over the watermelon and toss gently once again. Sprinkle crumbled feta over the top and serve, using a slotted spoon. This entry was posted in Fruit, Fruits and vegetables, Salads, Tips and Tricks and tagged feta, lime, mint, salad, smoked, smoked salt, watermelon. Bookmark the permalink. Wow, I would never have thought of smoking watermelon!